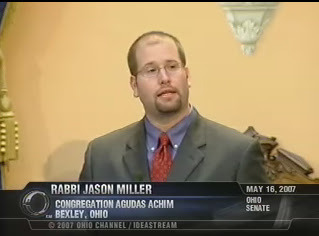 I got very nervous today when everyone started telling me about the media reports that a clergyman made inappropriate religious comments in his opening invocation at the Ohio Statehouse in Columbus this past Wednesday (video). This is because I opened Wednesday's session of the Ohio Senate with a prayer. Perhaps I shouldn't have mentioned that it was Yom Yerushalayim (Jerusalem Day), I thought. Or maybe I shouldn't have mentioned the Six-Day War that took place forty years ago in 1967 and then made reference to the current war that U.S. soldiers are fighting in that region of the world. Well, fortunately, it wasn't my speech that was the provocative one that afternoon (or if it was provocative, it wasn't completely out of line). Apparently, a short walk down the hall from where I opened the Ohio Senate, in the Ohio House, a pastor invoked the name of Jesus several times and strongly encouraged the passing of a bill that was before that legislative body during that session. Both of those acts are forbidden. 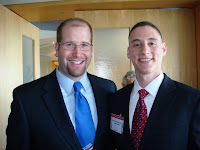 Ohio Representative Josh Mandel (left), the 28-year-old Jewish Republican from Lyndhurst who served in Iraq, said he had no problem with Wednesday's prayer, saying clergy of any religion should have the freedom to speak freely. Ironically, I was with Josh on Monday evening at the Annual AIPAC event in Columbus and I asked him to come speak at my synagogue. Who says there is such a thing as the "separation of Church and State" anyway? In all seriousness, there are problems with having religious leaders address our elected lawmakers before their legislative sessions. By accepting invitations to deliver the opening prayer, as I have now done twice, I am contributing to the problem. Perhaps, the only answer is to eliminate the opening prayer. But that wouldn't change the fact that religion is still a major part of the political arena (both locally and nationally). The Associated Press picked up the story and it ran in papers all over the country on Friday. Growing concern that prayers recited at the start of Ohio House sessions are potentially offensive to some members has pushed leaders to insist that all prayers be turned in for review at least three days in advance. Too many guest ministers are invoking the name of Jesus during their prayers, a no-no under House guidelines, which, based on a 1983 U.S. Supreme Court ruling, requires such prayers to be nondenominational, nonsectarian and nonproselytizing. Guidelines also say prayers should avoid contentious subjects. That sparked a memo from House Clerk Laura Clemens to all members. "I have received several legitimate complaints from members recently about the disregard for the guest minister guidelines, more specifically the increasing tendency of our guest invocators to use language referring to a particular deity," she wrote. House Speaker Jon A. Husted, R-Kettering, requires that all prayers from guest ministers be delivered to the clerk's office 72 hours in advance -- a deadline that had been loosely enforced. "We want our guest ministers to be able to speak freely, but we also want to keep in mind all of the members in the chamber," said Karen Tabor, spokeswoman for Husted. Rep. Chris Redfern of Catawba Island, the Ohio Democratic chairman, was one of two Democrats to walk off the floor during Wednesday's prayer. He said prayers over recent years have become "increasingly evangelical." "The opening prayer is a time to be mindful of the obligations that we've been granted through our voters and gives us a chance to reflect," he said. "It should not be used as an opportunity to proselytize. At times, all we're lacking is a river to take members down to dip them in." Other reaction was mixed. Rep. Matt Huffman, R-Lima, who invited Hamblen to give the prayer, said it was inappropriate for him to mention issues on that day's agenda. "I kind of cringed when he did it." Rep. Josh Mandel, R-Lyndhurst, one of two Jewish members in the House, said he had no problem with the prayer. "Our country is based on freedom of religion, not a freedom from religion," he said. "Clergy of any religion should have freedom to say the opening prayer of their wish." Charles Wertz agrees. The Madison County resident and pastor of Journey of Faith Fellowship said it's appalling that for a prayer to pass political correctness, "you have to gut all the things that make any prayer significant." Christians naturally pray in the name of Jesus, he said. "There's a stupidity to all this in that if they don't want somebody praying in the name of Jesus, then don't invite a Christian," Wertz said. The U.S. Supreme Court has generally banned government-sponsored prayer at public events. But in 1983 it made an exception for Congress and state legislatures. But challenges continue. An Indiana federal district court ruled in November 2005 that legislative prayers no longer could invoke the name of Jesus. The case was appealed. A 2002 survey by the National Conference of State Legislatures found that 37 legislative chambers had guidelines for invocations and three required clergy members to submit their prayers for review. The Ohio Senate has guidelines on content but does not require prayers to be submitted. Raymond Vasvari, a First Amendment specialist and former legal director for the American Civil Liberties Union of Ohio, says the Ohio House is in a bind. While leaders don't want sectarian prayer, government inviting a minister to speak and then vetting his or her prayer is akin to illegal prior restraint, he said. "They need to pick people who aren't going to say things that are overly divisive," he said. "But once they open the door and invite a guest minister in, they pretty much have to live with what he intends to say until he's done saying it." Clemens, the House clerk, wrote that the policy may limit the ability to have a guest invocator at every session, but she asked members to help her enforce it. "I would hate to have to eliminate this program but may find it necessary to do so if this trend continues," she wrote.